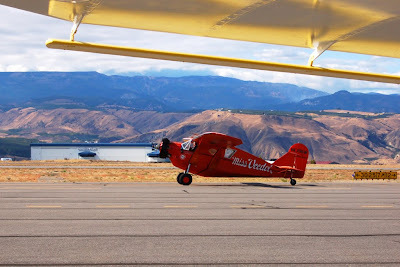 The first weekend of October the local airport always puts on display their old airplanes and many of the private owners have their planes out as well. We went last year and really enjoyed it. This year the weather was a bit nicer so we stayed longer because it wasn't freezing cold out! 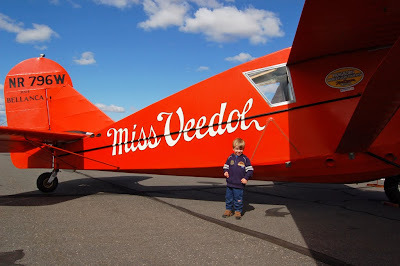 Here's a replica of the Miss Veedol, the first plane to cross the Pacific and not stop for refueling. Our local claim to fame is that they landed here. The original was eventually lost in a water crash, but the local aviation buffs have made the replica. And it's not as big as you might think!!! 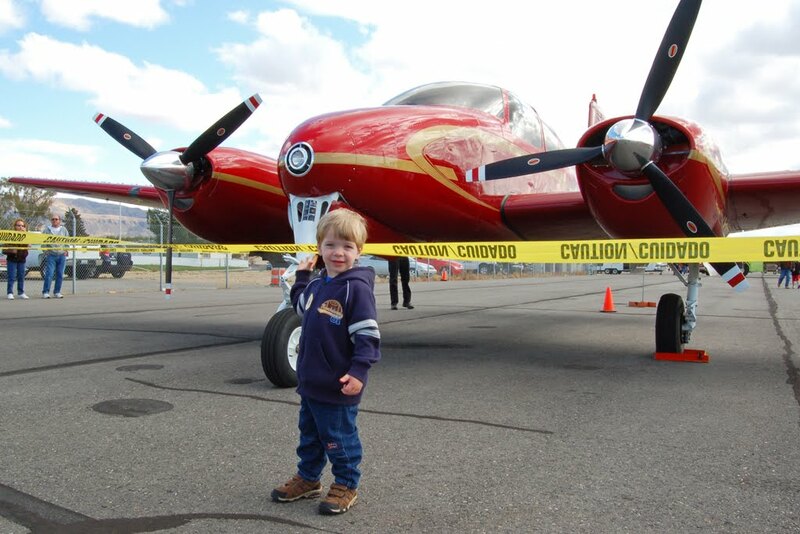 Cory really liked all the red planes of course! 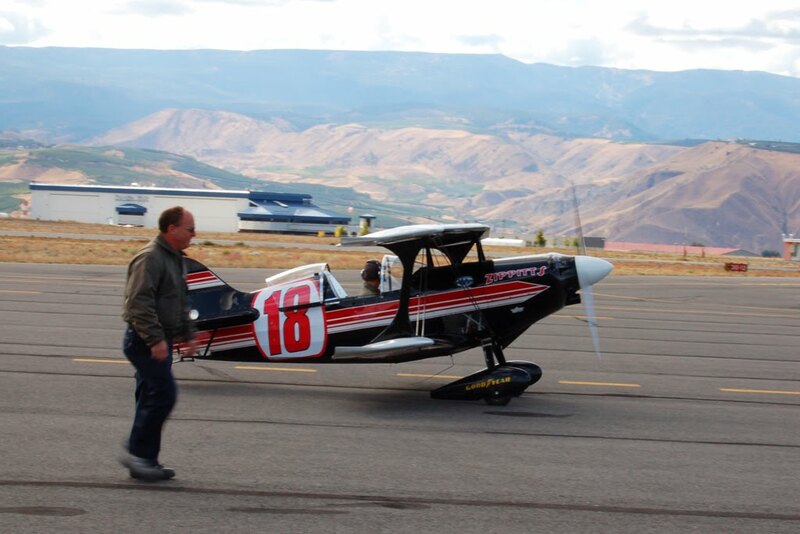 This was a racing plane like you see on TV (sponsored by Red Bull I think?). We didn't see it doing any tricks, but talked to the owner. They race at crazy speeds just a hundred and fifty feet off the ground or so! The thing Cory remembers most from this year though is our experience in the fire house. It's a little trailer that the fire department uses to teach kids about how to safely get out of a house fire. I didn't have time to warn Cory that the alarm was going to go off. He was interested in the (fake) smoke for about 2 seconds and then when the alarm went off started freaking out. He wouldn't out out the small window even though Brian was right there so we had to go back the other way... He still remembers it and we talk about getting out of a house if there is ever smoke so maybe this is a lesson that will stick with him! Here's hoping he never has to use it! Those are some pretty cool planes! I would love to see them in person! My little boy is fascinated with planes and I'd love to be able to take him to see some but I'm not sure how to go about it and keep him safe at the same time. I don't want to just take him to an airport and I can't think who may have the time to give him a real tour. I'm glad Cory had a lot of fun though!